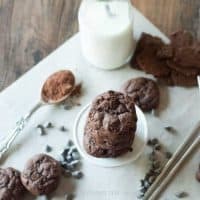 Cheesecake cookies are soft and rich and taste just like a bite sized chocolate cheesecake! A few friends of mine have declared this day Cheesecake Day. I was asked to join in the fun, but here’s the rub; I don’t care for cheesecake. Weird, I know. I think it has a lot to do with the cheesecake my mom made when I was a kid. It was the kind with chunks of pineapple and large curd cottage cheese. Just what you want in a dessert right? After those first few experiences with cheesecake I decided cheesecake just wasn’t worth my time. I have tasted good cheesecake. I’ve decided I still don’t care for it. Let me put it another way. It’s not as though I don’t like cheesecake, I just prefer desserts with frosting like cupcakes or cake, but I’ll certainly settle for anything with crumbs like brownies or cookies. You see where this is headed right? Why not take something I am wild about like cookies and add a cheesecake twist! These cheesecake cookies are truly the best of both worlds. The cream cheese in these cookies makes them soft, rich, cake-like bites of heaven that melt in your mouth like a good cheesecake should. They are so incredible right out of the oven but they are just as good an hour later, 3 hours later, the next morning and so on. I confess, I could not stop eating these cheesecake cookies! I hope salad day is the next week. After devouring all these sinful cheesecake cookies, a huge green salad would probably do me some good! Cheesecake cookies are soft and rich and taste just like a bite-sized chocolate cheesecake! In a bowl, cream together butter and cream cheese. Add eggs one at a time. Beat in vanilla. 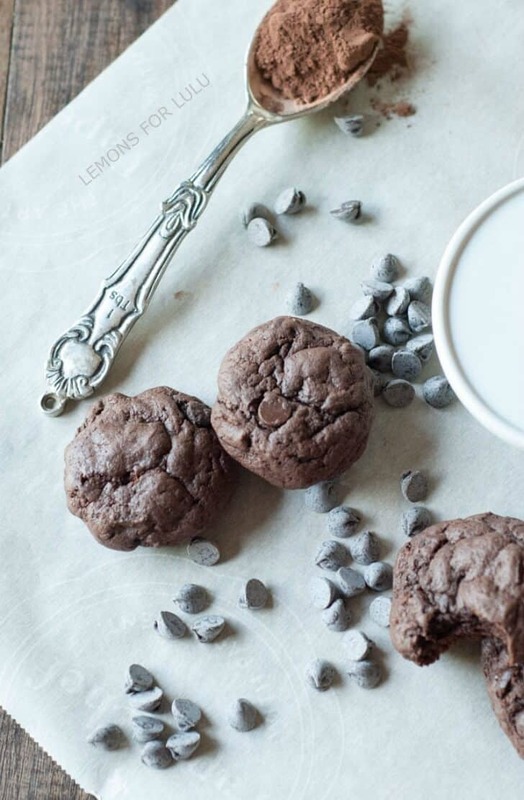 In a small bowl, combine flour, cocoa powder, baking soda and salt. Carefully mix dry ingredients into butter mixture. Beat until combined. 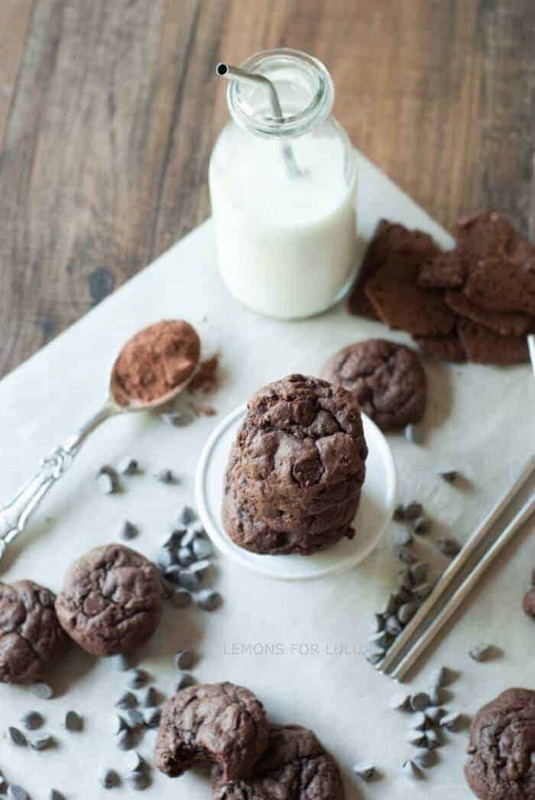 Stir in chocolate chips and brownie pieces. Chill dough for at least 1 hour or until easy to handle. Preheat oven to 350. Line baking sheets with parchment paper. 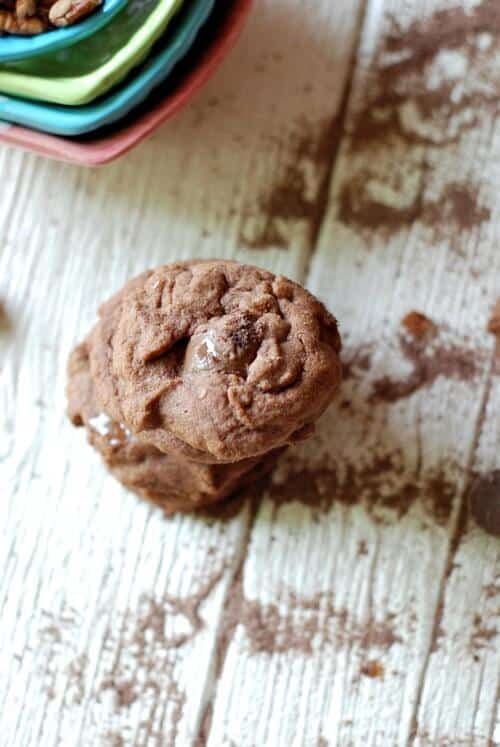 Using a large cookie scoop, scoop up cookie dough and roll into a ball. Lightly flatten each cookie. Bake for 10 minutes. Remove and let cookies rest on baking sheets for 2 minutes. Remove to a cooling rack. Oh, boy, do these chocolate wonders look amazing! Happy Cheesecake Day!!! Oh, great idea to combine cheesecake and cookies! Love how thick and chocolaty these are! I, on the other hand, could eat cheesecake everyday, whether in cookie form or baked in a cake pan! I wish you shared my love for cheesecake, but at least you make up for with these yummy cookies!!! Oh my! If my first experience with cheesecake consisted of cottage cheese and pineapple, I’d probably run the other way, too! 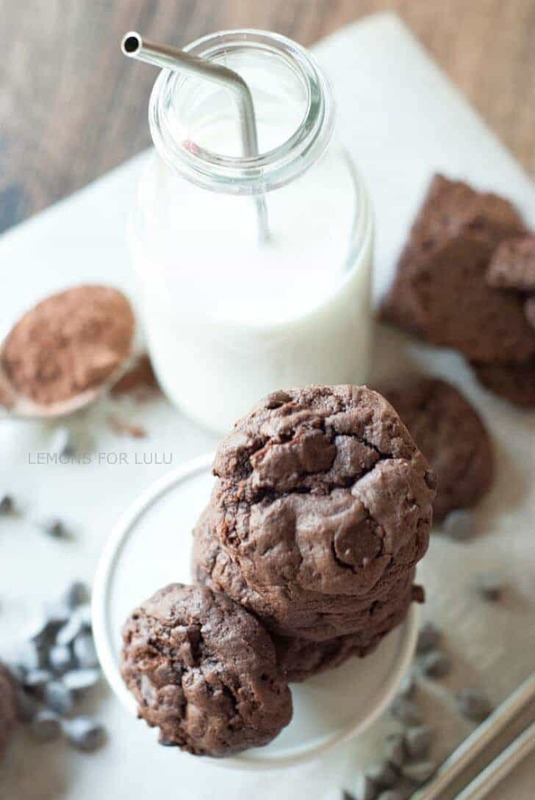 These cookies are the perfect happy medium. Whoa, do these look incredible!! 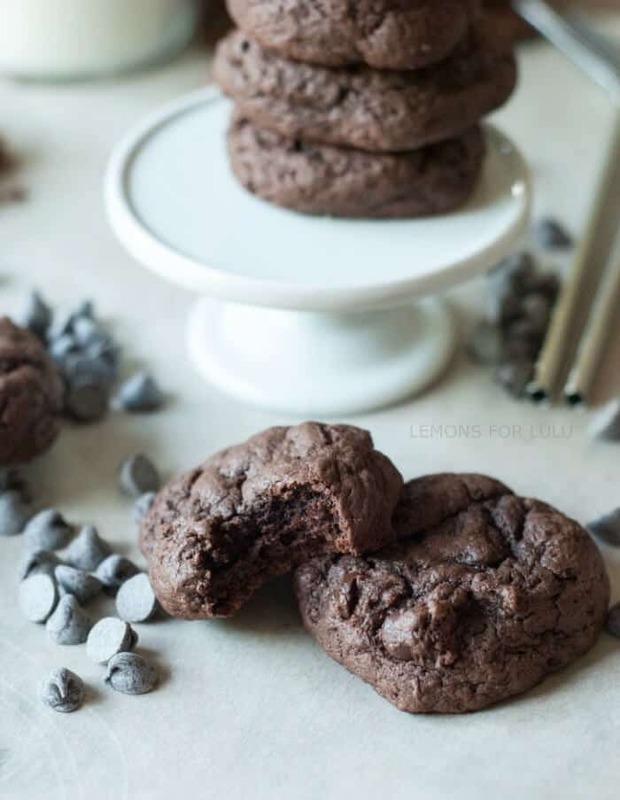 My chocoholic family thanks you for this recipe! But I think I’m going to need a salad day next week, too! I don’t think I’ve seen cheesecake cookies before although I have made cookies with cream cheese. Anyhoo, your cookies look so soft and rich no wonder you couldn’t stop eating them! So many amazing things in one place! Love these! Cheesecake AND chocolate…oh my! That sounds amazing! Love the richness of chocolate and cheesecake together, huge YUM!!! Me too Tara! Thank you! What a tasty twist on cheesecake! Love these cookies Tanya!! Thanks for sharing with us at Best of the Weekend – being featured on my blog tomorrow night as a after school snack! Love how inventive with cheesecake you are. Thank you Noemie! I got about 48 from this recipe. 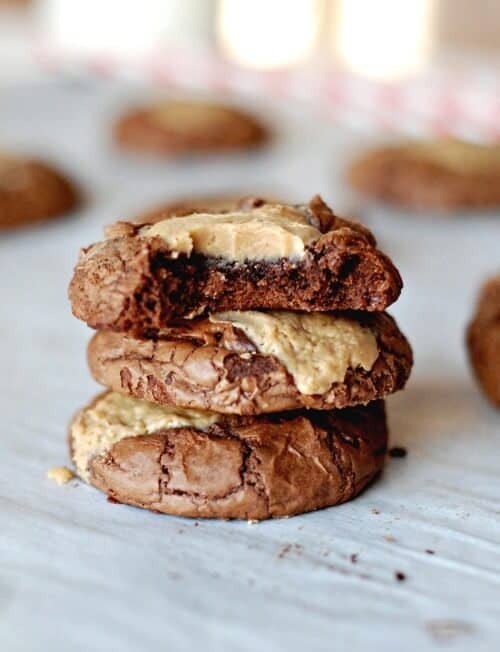 Excuse me, but BROWNIE CHEESECAKE COOKIES?! Hold me. I need a dozen! These look like perfection. But what is Brownie Brittle? I’ve never heard of that. Oh it’s wonderful! It’s like a thin and crispy brownie cookie! I can find it at Costco. I may have seen them at Target or Walmart too.